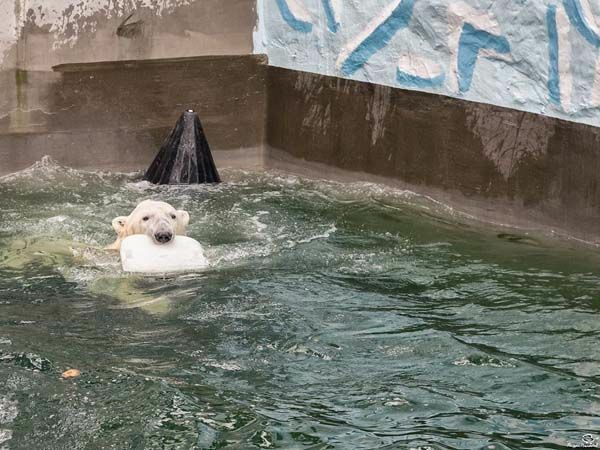 The Novosibirsk Zoo continues to work on improving the living conditions for their animals. One of the most important issues of animal welfare is the enrichment of their environment. Simply put, we try to make sure that our animals are not bored. Activity is necessary for their mental and physical health. 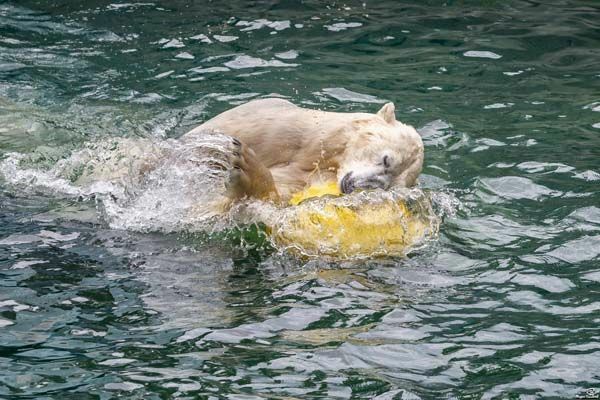 PJSC “NK” Rosneft “is the ‘god mother’ of our pair of polar bears and helps the zoo to make their life more interesting and active. 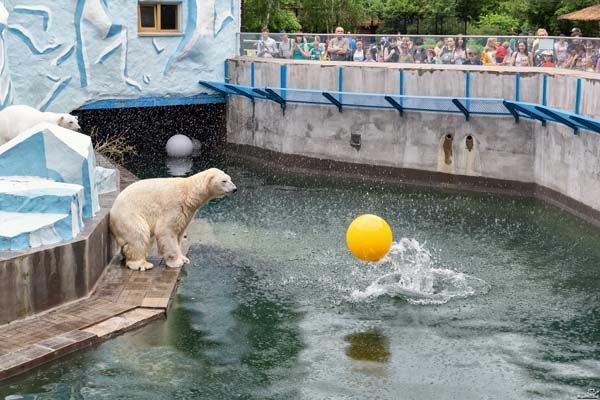 In the end of June Kai and Gerda received gifts from the company PJSC “NK” Rosneft ” – a particularly strong ball and a cone. 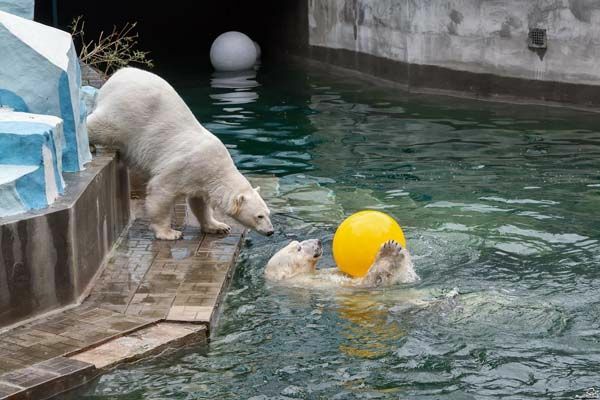 Kai and Gerda are always willing to play with large objects, which can be taken in the teeth, between the paws and then thrown into the water. They are especially pleased with the new toys. Both bears played with the new toys for a long time. No doubt the gifts were very much appreciated! 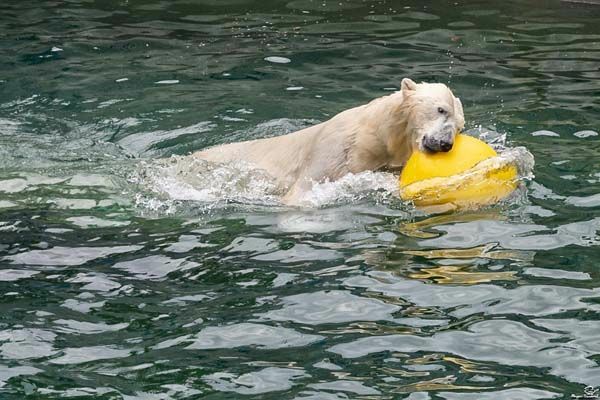 The Novosibirsk Zoo thanks the PJSC “NK Rosneft” for assistance in keeping polar bears. die beiden Bären lieben dicke Bälle und haben viel Spaß damit. Fein, dass viele Zoofreunde die Tiere mit passendem Spielzeug beschenken. Vielen Dank für deinen Bericht und die schönen Fotos von den prachtvollen Bären Gerda und Kai! 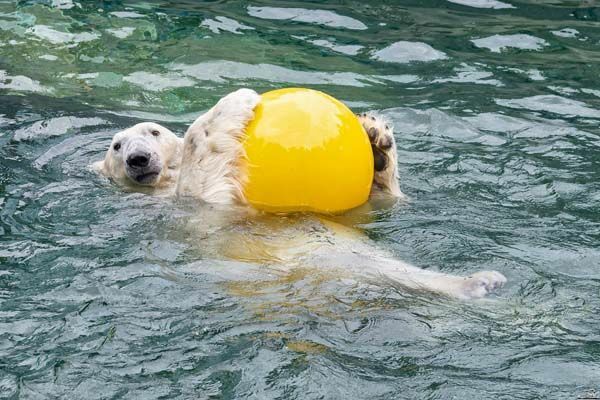 Polar bears always enjoy playing with their new toys. Some of them will be long-lasting favorites. This great yellow ball looks very pleasant to both. Thanks for this report and these nice pictures. Thank you a lot for the informations and the nice pictures !!! Gerda and Kai can take part in the World Cup celebrations. Two very happy Polar Bears! 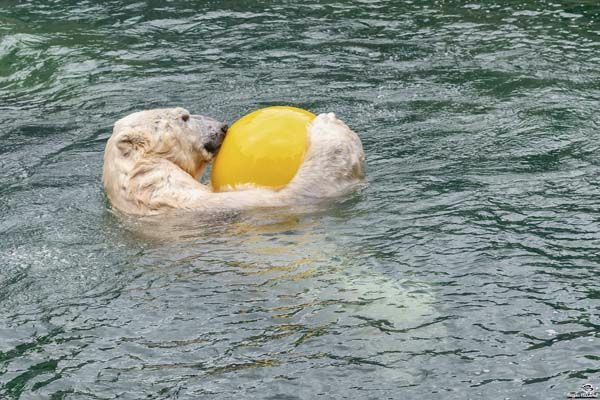 Everyone who ever saw big and grown up bears playing happily with their toys will never get enough of this sight. If great balls, tyres or other toys they really have fun and appreciate these gifts. This is what behavioural enrichment means! Thank you for this pleasant news and heartwarming pics of Gerda and Kai. Es freut mich, dass die Bären neue Bälle bekommen haben. 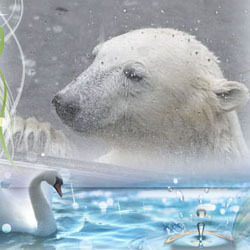 Thanks to the NOVOSIBIRSK ZOO* and ANDREY POLYAKOV as well as t MERVI who makes it possible for us to be able to see gorgeous photos and read interesting information about zoos and mainly about polar bears from all over the world. 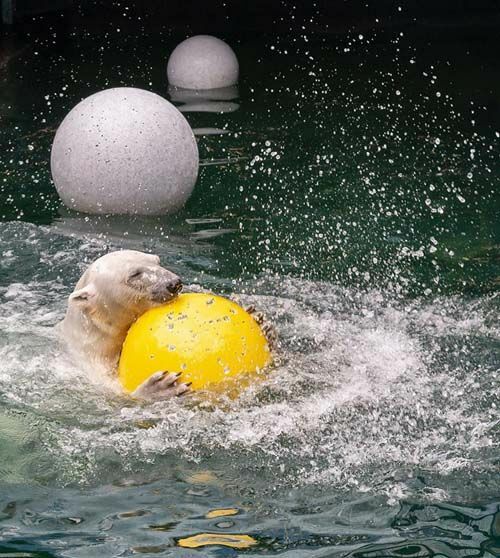 Beautiful proof is made by this contribution that even in rather small enclosures polar bears can have lots of fun if they get good food and appropriate and exciting playing stuff. The balls are just the right thing for our beloved white giants! 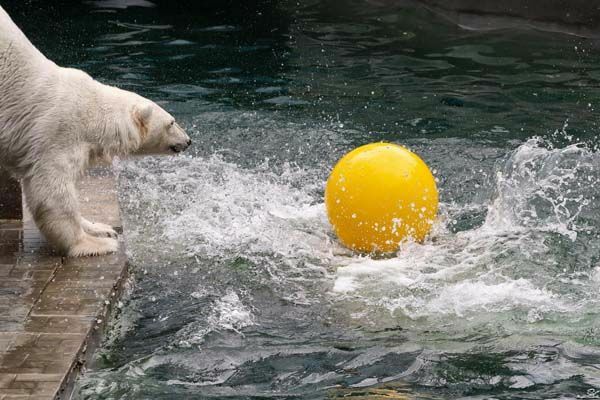 May KAI and GERDA continue to be happy polar bears under your aegis*! danke für`s Zeigen der schönen Fotos von Kai und Gerda. Es ist schön zu sehen, dass die Bären beschäftigt werden. Der gelbe Ball scheint wohl der Favorit zu sein. Ich liebe die Fotos, wenn Eisbären im Wasser auf dem Rücken liegen, und ihr Spielzeug in den Pfoten halten. Ich wünsche Gerda und Kai weiterhin viel Spaß mit ihrem neuen Spielzeug. toll wenn ein so großzügiger Sponsor für die Tiere das Spielzeug besschafft. Diesen großen Ball würde ich auch gerne besorgen, aber ich fürchte das ist zu teuer. Vielen Dank auch an den Fotografen Andrey für so schöne Bilder von Gerda und Kai. Danke für Bericht und tolle Fotos. 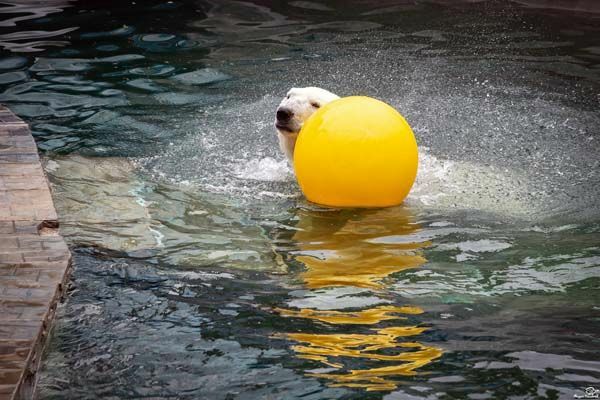 I am very glad that Kai and Gerda from Novosibirsk have such wonderful toys, what a great pleasurre for the lovely bears to play in the pool and it is also a joy for all the visitors to see content bears. Log in | 54 queries. 0.805 seconds.